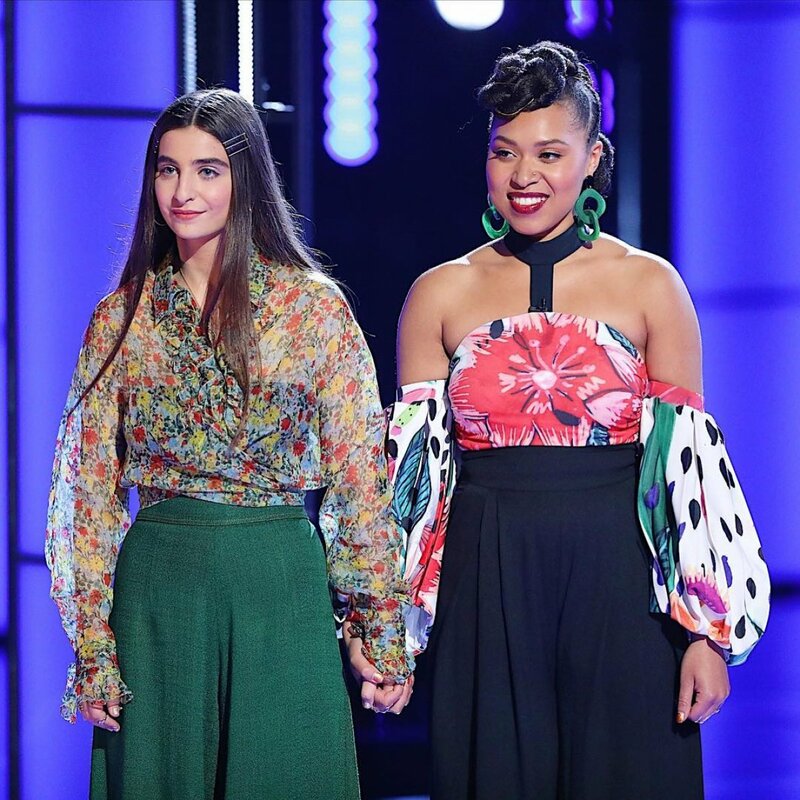 The Voice advanced eight Cross Battle winners, three stolen artists and two saved artists during Tuesday night's one-hour results show for Season 16 on NBC. The Voice host Carson Daly announced the winners of the eight Cross Battle pairings who performed live for home viewer votes on Monday night's two-hour show. Artists who received the most votes in each Cross Battle pairing automatically advanced, but each coach is allowed one "Steal" and one "Save" to use during this round in the heat of the moment. The winners of the first set of Cross Battles for Season 16 were Kim Cherry, Matthew Johnson, Maelyn Jarmon, Oliv Blu, Presley Tennant, Lisa Ramey, Mari, and Dexter Roberts. In a shocking turn of events on Tuesday night, only three artists were eliminated from the competition because Kelly Clarkson, Adam Levine, John Legend and Blake Shelton chose to take advantage of their steals and saves early on. Cross Battle results for Team Blake's Kim Cherry vs. Team Kelly's Betsy Ade were shown first. Blake said he was honored that Kim chose him as her coach and she was "a blast to work with" as well as "super talented." Kelly told Betsy that she believed in her before Betsy even joined her team and she's very special and unique. America saved Kim, so Betsy assumed she had been eliminated. The four coaches, however, only had 10 seconds to decide whether they'd like to steal or save Betsy, and almost immediately, Adam and John both tried to steal her. Adam said he wanted to work with Betsy since the beginning of the competition and he's always been a fan. Adam wanted her on his team "so, so badly." John -- Betsy's original coach -- admitted he made some "rookie mistakes," and one of them was letting Betsy go because he chose a poor Battle pairing and thought she belonged on his team. "I would love for you to come back home!" John yelled. Betsy thought it would be incredible to work with three coaches on The Voice, so she opted to join "Team Adam." Next up was Team Adam's Domenic Haynes vs. Team Kelly's Matthew Johnson. Kelly told Matthew she couldn't envision him going home because he can move people, especially with his wide range. And Adam expressed how he can't imagine a world without Domenic on his team. America saved Matthew, but Adam decided to instantly save Domenic. "It's too early to make these kinds of decisions right now, but to feel like this would be the last time we were working together just doesn't feel right to me," Adam explained. "It feels like the very beginning... and I just can't stomach the idea of you not being a part of it." Carson then brought Team Legend's Maelyn Jarmon and Team Adam's Rod Stokes to the stage. John told Maelyn he believes in her so much and her voice and artistry is so special. He found her impressive and complimented her gift. Adam admitted he was "blown away" by Rod's performance the previous night and probably shocked America. The coach gushed about how Rod should be on the show to the very end. America saved Maelyn. Just as Rod thought he was going home, Kelly opted to steal Rod for her team. She gushed about loving Rod and his talent. Results were then delivered to Team Adam's Celia Babini and Team Blake's Oliv Blu. Adam called Celia amazing and said this is the very beginning of her journey and he has "full belief" in her. Blake thought Oliv had an incredible performance and was honored to have her on his team. America saved Oliv. Just as Celia thought she was being ousted from the competition, John decided to steal her. "I turned for you when you originally auditioned and I think you are fantastic, unique and special. We're going to make sure you knock it out of the park next time, and you're going to keep winning after this," John declared. Next up was Team Legend's Kayslin Victoria's Cross Battle results against Team Kelly's Presley Tennant. Kelly gushed about how Presley sounded better than ever the previous night and she executed so much "volume, range and confidence." John told Kayslin he loved working with her and she has such a powerful voice. He also said she sings with "swagger" and will blossom into a great artist. America saved Presley, resulting in the elimination of Kayslin. Carson then delivered results to Team Kelly's Karen Galera and Team Legend's Lisa Ramey. John loved working with Lisa and said she always lights up a room with her positive energy and strong voice. He had a great experience with her thus far. Kelly insisted Karen is such a hard worker and takes constructive criticism so well. She had "no fears" for this artist after the show because she represents something so cool. America saved Lisa, which ultimately sent Karen home. Carson then brought Team Adam's Mari and Team Blake's Selkii on the stage. Adam told Mari he loves her and she's so special. He couldn't envision not having her on his team because she "has it all" as a singer and human being. Blake admitted Selkii is one of his favorite artists he's ever worked with on the show because of her talent and work ethic. America saved Mari, but Blake decided to save Selkii. "The only chance I have of keeping my team together is to use this 'Save' right now. I believe in every single one of y'all. I've got this card to play right now and I'm going to play it! You're coming with us!" Blake explained. Results for the final Cross Battle pairing from Monday night were then revealed. The pairing was Team Adam's Andrew Jannakos and Team Blake's Dexter Roberts. Blake gushed about being Dexter's fan, saying he's "one of the best country singers who's ever walked across this stage." He felt good about Dexter staying. Adam insisted Andrew should drive right down to Nashville, TN, and try to get a record deal after the show if he doesn't stay because he has such a unique look and boasts so much power as a country singer. America saved Dexter, but Andrew was unfortunately sent packing. Next week, 16 more The Voice artists will sing for home viewer votes in eight Cross Battle pairings live. Another results show will also follow next Tuesday night, and the Top 24 artists will be determined.